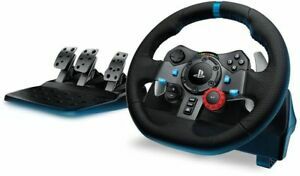 Enjoy precision gaming control with the Logitech Driving Force G29 wheel and pedals set. You can rely on this gaming controller for an intuitive gaming experience. It is a wired device, which connects easily to the console. This controller can be used with Sony PlayStation 3/Sony PlayStation 4 consoles for bringing entertainment to the next level right in your home. Immediate payment of US $179.90 is required.